It had been pouring rain for a few hours and then suddenly it stopped. This puddle on the bridge's pedestrian path reflects the still cloudy sky and the iron structure of this drawbridge. Built in 1935, it is one of the four bridges that crosses the Estuary and connects Alameda to Oakland. For more worldwide Weekend Reflections, click here. The Greyhound Station is located at 22nd St. and San Pablo Avenue. This is an edgy neighborhood that is on the cusp of being transformed by the new condos in the area. Still, a security guard meets everyone at the entrance to the waiting room (under the blue dome). I think this station was built in the 30s, but there is no vestige of the deco era either inside or out. 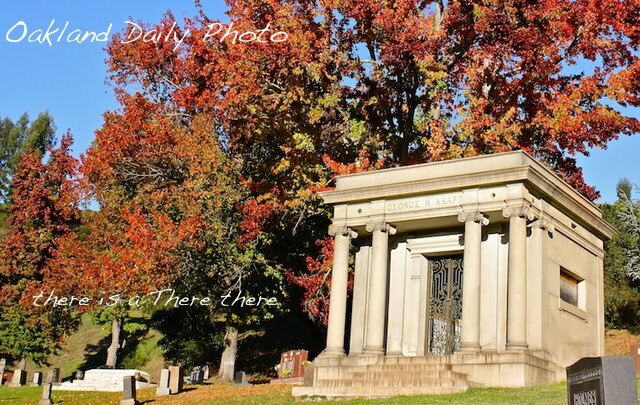 For more Skywatch Friday photos, click here. Esther's was one of the West Coast equivalents to New York's Lenox Lounge (see Ken Mac's post). However, Esther's story has a sadder ending. The Orbit Room was part of a thriving West Oakland 7th St. music scene in the 50s and 60s. Like the Lenox, Esther's hosted big blues and R and B acts including Aretha, BB King, and Etta James. But the forces of urban renewal had a huge negative impact on Esther's business. The building of the vast complex of the Post Office distribution center across the street and then the West Oakland BART station made the noise level too high for performers to compete with. The 18-wheelers and BART trains literally shook the building. The Orbit Room stayed open for years as a local bar and restaurant with a great jukebox selection, but finally closed its doors last fall after 51 years. The Oakland live blues scene has pretty much evaporated except for some acts at Yoshi's jazz club. Spotted on International near 13th Avenue. An amusing combination, to say the least. What's next? Perhaps "Donuts and Tattoos." Your suggestions? This cool, old sign doesn't look like it works anymore. 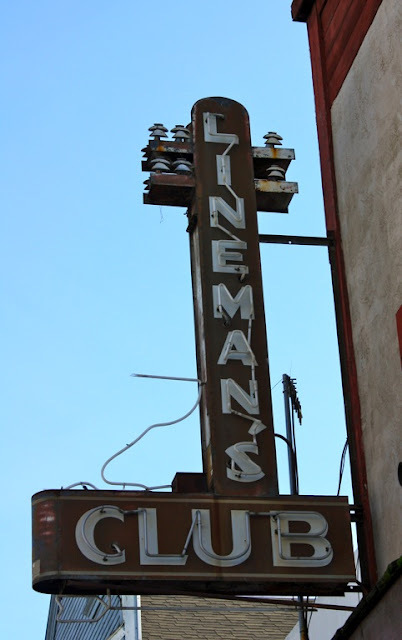 Who knew that telephone linemen had their own bar? Notice the fake transformers insulators at the top of the "pole." The club is long gone and is now a Laotian grocery store. International Blvd. runs from downtown Oakland southeast through both San Leandro and Hayward. 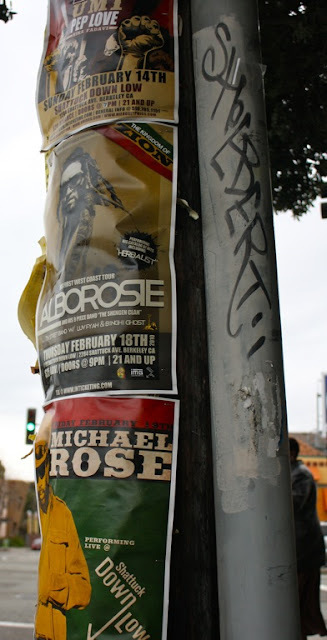 Many still call it by it's original name: E. 14th St. A decade or so ago, local politicos wanted to honor the diverse cultures that live in East Oakland as well as burnish the tarnished image of this section of the city, so renamed the street. A drive down this thoroughfare and around its various neighborhoods reveals a treasure trove of pre-1906 buildings. 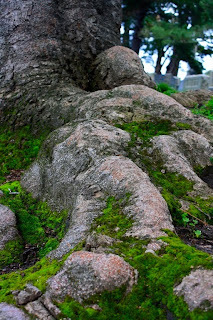 They survived the big SF quake and are still in use today. This grand Queen Anne house is now the home of a Vietnamese real estate agency in the San Antonio neighborhood. Downtown at 13th and Webster (I think) with a reflection of the Tribune Tower. Don't know the name of this modern building. 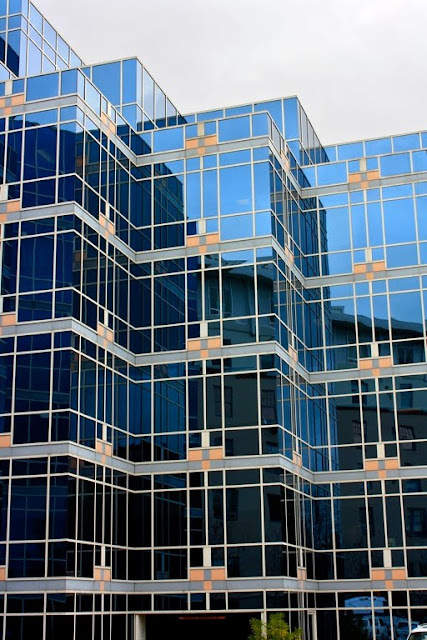 Glass fronted buildings are not my cup of tea, except for Weekend Reflections, of course. Click on the link to view other photos on James' meme. Join us; it's fun. Nothing to watch in this Skywatch. It was gray overcast all day. Yuck. And wouldn't you know it, the skies cleared at dusk and the stars are now shining. 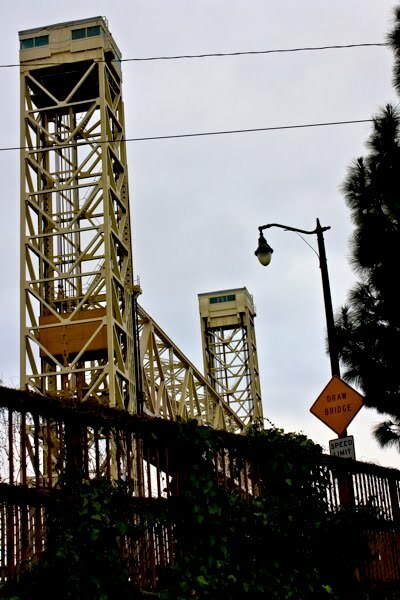 This is a photo of the Fruitvale Bridge to Alameda. Alameda is a small island community bordered by the waters of the estuary and the Bay. There are four (draw) bridges and one underwater tunnel to Alameda from Oakland. It's quite amusing to see a bridge draw up and stop traffic for a little putt-putting boat with a tall mast. For other Skywatch photos, click here. Meet Maria the Tamale Queen. She and her assistant turned out to feed the crowds at the recent Preview Sale for the White Elephant Sale. Held in a 96,000 sq. ft. warehouse, this is an annual event that raises money for the Oakland Museum and is now in its 51st year. With all volunteer help and all donated goods, last year we raised more than $1.3 million to support the museum, (which is currently being renovated and will reopen May 1). The big sale is always the first weekend in March. If you're in town, come on by. Entrance is free. Believe me, you'll be amazed at the sheer volume of goods for sale and the bargain prices. You'll probably see Maria too. She told me she's been coming every year for the last ten years. I can vouch for her tamales; they are muy sabrosos. 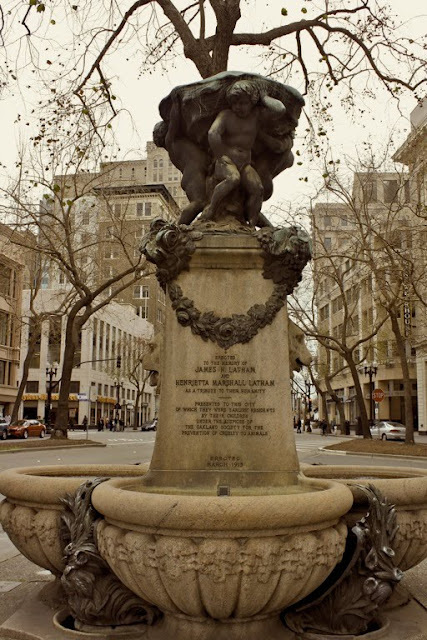 This is the memorial fountain in Latham Square where Telegraph Avenue joins Broadway. Erected in 1913, with the putti and floral swags it reminds me a little of Parisian monuments. Well, okay, maybe if you squint real hard and have the sun in your eyes. On all of the main corridors there isn't a telephone pole that doesn't have some kind of announcement---music, theater, political, lost animal, etc. The 21-story Tribune Tower has been a local landmark since 1923. It's now dwarfed by more recent buildings. 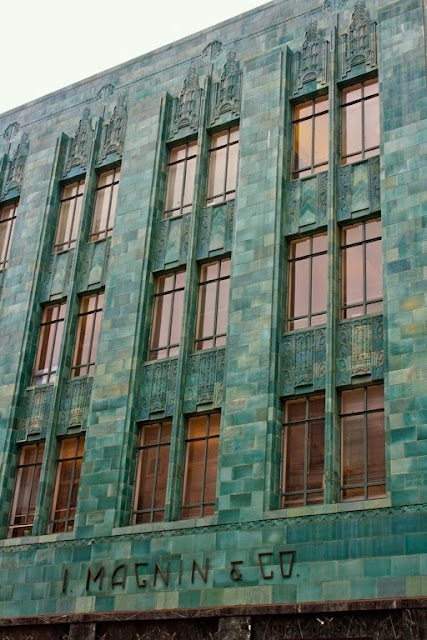 The Tribune newspaper moved to new headquarters in East Oakland after the 1989 earthquake. The new owners retrofitted the building, spruced up the clock face, and are renting office space. Caught this reflection after a recent rain. For other Weekend Reflections, click here. The Oasis Market opened last fall at the corner of Telegraph and 30th to immediate success. 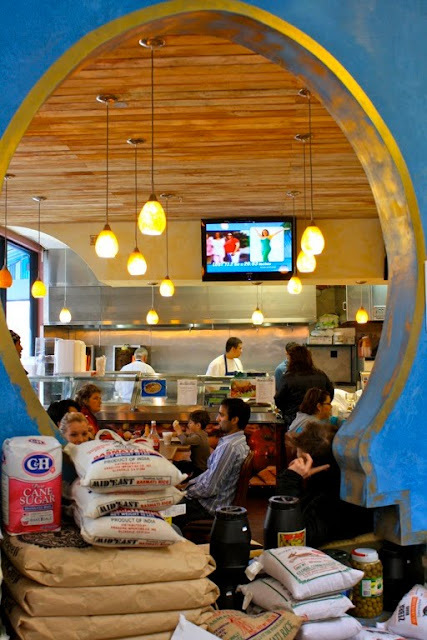 It is a middle eastern market and restaurant with prices that can't be beat. It draws middle easterners from all around the East Bay. The Yelp and Chowhound crowd loves this place. Local newspaper articles credit it with improving the character and safety of the neighborhood. The Oakland Islamic Center is around the corner. My first visit last week yielded freshly baked pita bread, a delicious tabouli salad, and a variety of olives at a real good price. Next week it will be lunch and stuffed grape leaves to go. Yum. This is the I. Magnin building at 20th and Broadway. It housed a chic department store until its closing in 1995. Now it has a cafe and dress shop on the ground floor and offices above. It was built in 1930 and is made of green terra cotta tile and black serpentine. Isn't it stunning? Sorry to violate the one picture only rule, but I couldn't get just one photo to do it justice. I like the way the black base creates a visual pedestal for the floors above, the way the big windows lighten the bulk of the building, the distinctly deco bas-reliefs, and most of all the color. The varigated tile colors let the eye dance across the surface. I read somewhere that there was a penthouse on top. Wouldn't that be something to see. The Breuner Furniture Company went out of business several years ago but their corporate building lives on at 22nd and Broadway. It has a monolithic, looming quality, but the deco friezes are wonderful. You tend not to notice them unless you're across the street. Too bad it's painted this boring grey-green color. I was tromping all over downtown and didn't have the presence of mind to go inside and see if there are any deco grace notes within. Next time. 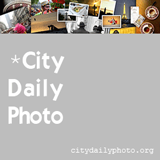 One of the great things about CDP is that it makes you really look at your surroundings. I've been on Pill Hill a gazillion times but somehow never registered this blue glass hospital until a few weeks ago. It is the Alta Bates Summit Medical Center on 30th St. I don't know when it was built or who designed it---but whether or not you like it, it gets your attention. (Sooner or later). Pill Hill is a real hill between Broadway and Telegraph that has been home to a hospital, doctors' offices, and pharmacies since forever. For other Weekend Reflections, click here. Skywatch Friday: Looking toward San Francisco this afternoon from the Mormon Temple. The past few days the clouds have started out a billowy, snowy white and stack up above the Oakland hills. In the afternoon they start to get dark undertones. Late afternoon they turn into a grey "marine layer." Eventually the rain starts to fall in the early evening. Mostly we're grateful because we sorely need the rain. This building looks like it's the same vintage as yesterday's post. Check out the roof cubes. It is the 1/4 lb Giant Burger on Telegraph and 21st St. It may look past its prime, but people still pull in and order. 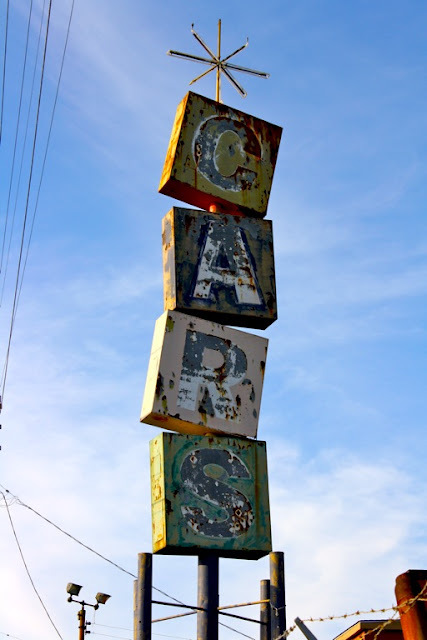 This sign is all that's left of a used car lot that closed years ago. I love the little sputnik-like finial at top. There's still an arrow that points to what is now a vacant lot on Foothill near Courtland Ave. This old building next to the Aloha bar looks like it's imploding. It's a cautionary tale on what happens to wood when it remains neglected and unpainted. One can barely make out the faded words Room and Board on the side of the building. Since it is located in front of railroad tracks, I'm guessing it once was a rooming house that served railroad men and maybe travelers. Looks like it was built before the 1906 earthquake. Why it's still allowed to stand is anyone's guess. 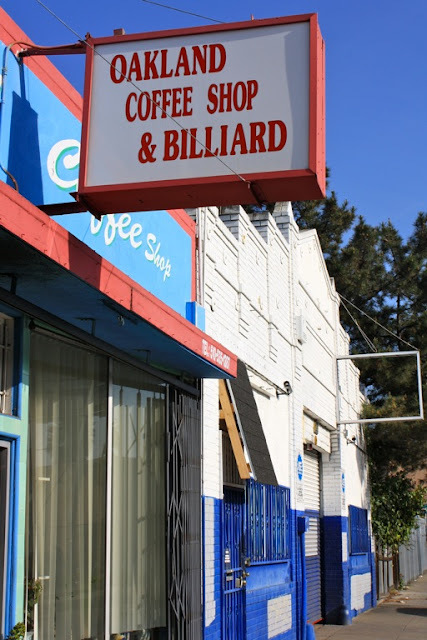 Located at Fruitvale and San Leandro Blvd.